AltSchool’s VP of Learning, Colleen Broderick, takes us through five elements of learner-centric education and shares how each element guides AltSchool’s pedagogical vision and development of practices and software. In this third installment of five, she talks about personalization. We have written a lot about personalization. Recently, our Chief Impact Officer Devin Vodicka unpacked the difference between pace-based, technology-driven personalization and empowering learners to tackle the real-world challenges that matter to them. Educator David Rodriguez shared the story of his challenges in the classroom over the years as he discovered what “personalized learning” means to him and how to best serve his students. Today, we approach this buzzword from yet another angle: How do we create learning environments that allow students to know who they are and what is important to them? With a strong sense of self, learners can make connections between what they are learning and their own experiences, interests, and aspirations, motivating their learning in formal education and beyond. Learn how we encourage students to take ownership of their learning with goal-setting. In a personalized, relevant, and contextualized environment, educators base learning experiences on a deep understanding of each student: How will this student learn best? Why does he or she need to learn this? How does this relate to what he or she already knows? At first, educators will answer these questions and design learning experiences accordingly. Then as students develop a strong sense of self, they will be able to answer these questions for themselves as learners. This gives learners a superpower as they move beyond their formal education and become lifelong learners who can identify and create their own personalized, relevant, and contextualized learning experiences. Our Lower and Upper Elementary students are rapidly developing their sense of self. 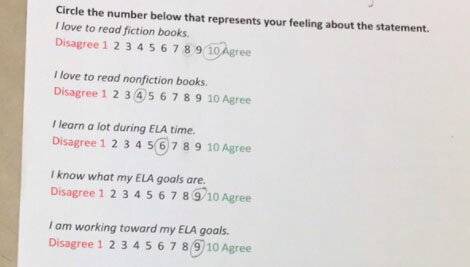 At the start of their current English Language Arts (ELA) unit, students used a rubric to assess themselves on various informational reading skills. This helped them and their teachers identify goals for this unit, which teachers and students entered together in the AltSchool platform. This enabled them to track progress and reflect on goals—through notes about one-on-one conversations, looking back at work a student submitted on his or her Playlist, or during structured reflection time at the end of the week. Students completed this survey on paper, took pictures of their answers, and uploaded them to their Playlist Card. They then met with their teacher in a one-on-one conference to discuss their answers, developing a more nuanced picture of the student as a learner. The teacher took notes on the conference and used that information to work with the student to adjust his or her goals and upcoming assignments. Finally, all information was shared with families in the parent app, enabling a dialogue that strengthened the learner’s sense of self at home and beyond the classroom.